You can’t just throw any old eggs into a skillet, watch them with one eye and think you’ll get perfect scrambled eggs. Using fresh, good-quality, organic eggs from free-range chickens makes a difference. They simply taste better, and fresh eggs have the nicest texture. In Europe, eggshells are coded with numbers to identify how the chicken was raised and in what country. The first number is key as it tells you whether the egg came from an organic, free-range, indoor (but not caged) or caged chicken. If this number is a 0 you know your egg is organic and free-range (what I recommend). If it’s a 3 never buy it again; it came from a chicken raised with 18 other chickens in a one-square-meter cage. This said, I bought some eggs from the Organic Farmers’ Market at Raspail last week and they didn’t have any markings. The colors were beautiful browns (white eggs aren’t common here) and as soon as I tasted them I could tell they came from happy chickens. Pans are tricky and we went without a non-stick pan for way too long because we couldn’t find the perfect one. There’s been a lot of controversy regarding Teflon over the years and I do believe many non-stick pans are toxic, even more so when they get scratched (go straight away and throw out any damaged pans you may have. I’m serious). Last year, we invested in two amazing ceramic-coated pans (Mauviel). They’re considered “green pans” because they don’t contain the toxins PFOA (perfluorooctanoic acid) and PTFE (polytetrafluoroethylene) like traditional non-stick pans. Not only are they safer alternatives, they are better conductors of heat. Food cooks well at lower temperatures (especially important for my scrambled eggs). To be honest, these pans aren’t completely non-stick, but are much better than our cast iron skillet (which I also love but not for making fragile dishes like eggs and fish). The inconveniences are that you can’t heat them really high (5 or 6 on our stove top which goes to 9) and you don’t want to let them get hot without anything in them. Also, you have to use wooden spoons, nothing too harsh to avoid scratching. None of this has bothered us and these pans have been a major factor in bettering all sorts of dishes. Gently beating your eggs with a fork, for about a minute, makes them light and fluffy. Don’t be aggressive; they don’t seem to like that. And only two eyes. I get nervous when people watch me make eggs. It’s all about timing (you don’t want to under or overcook) so you need to concentrate. Also, avoid toasting bread or chopping fruit as you scramble your eggs; any distraction can lead to disaster. 1. Crack the eggs in a small bowl and gently beat with a fork. 2. Add the cream and continue gently beating until the yolks, whites and cream are fully mixed and the eggs feel light. 3. Add the salt and pepper. Beat one final time. 4. Melt a pat of butter in the skillet, pour in the eggs and turn down the heat (3 out of 9 on our stove top). 5. Don’t touch for a few seconds, then (with a flat wooden spatula) gently scrape the bottom of the pan from top to bottom creating an empty space for uncooked egg mixture to fall into. Let sit a few seconds (covered) and then repeat and cover again. 6. After another few seconds, instead of attacking and “scrambling” the eggs, carefully fold them onto each other (you’ll have larger pieces rather than smaller ones). Repeat the folding and turning action as needed and until the eggs are cooked as you like them (if you add some cheese, a good time is just before they’re fully cooked). 7. Serve immediately (and don’t let sit in the pan). This entry was posted in Healthy Living, Paris Food Markets, Recipes (All), Recipes (Gluten-free) and tagged brunch, mains, markets. Bookmark the permalink. There’s nothing like a new ceramic-coated pan! Also great for fried and poached eggs. Charlotte will love them. 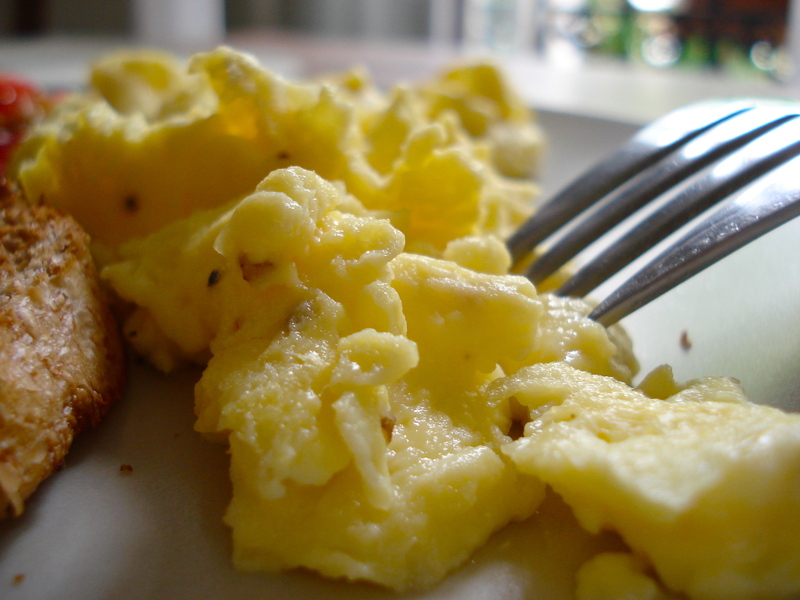 Pingback: Perfect Scrambled Eggs (Recipe) | The Tomato Knife | Recipes, Gossip & More!